A memory popped up on my Facebook page today and it’s one of my favorites, so I thought I’d share it here. 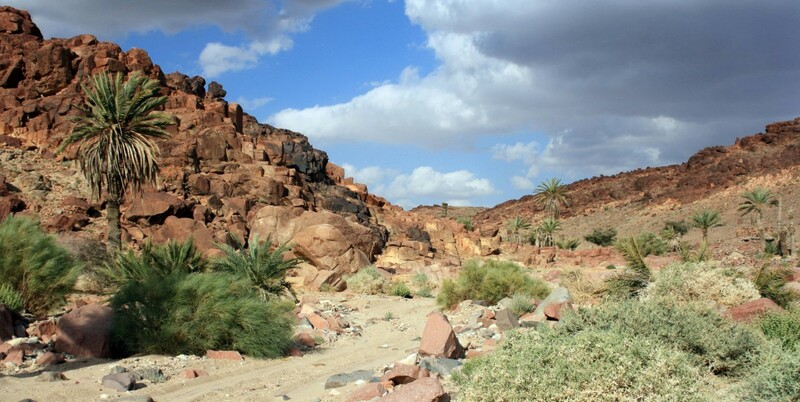 This post was originally published on May 6, 2014 on Bedouin History Desert Safari’s blog. It’s spring – my favorite time of year in Sinai! Especially after a particularly wet winter since that means our desert plants are thriving and the goats and sheep have plenty to graze. Recently, we met Freyj, one of Bedouin History’s drivers and guides, at his daughter’s springtime camp in the desert. We were welcomed with smiles and a light lunch of fresh bread and goat milk. It didn’t take long for the children to wander over to see their grandfather and his foreign friends. Freyj knows well my passion for plants and photography and knew I would be eager to explore the surrounding desert. Recalling our failed attempts last year to locate one of the edible plants, Zeinab, one of Freyj’s young granddaughters, eagerly offered to get her digging tools and lead our exploration. 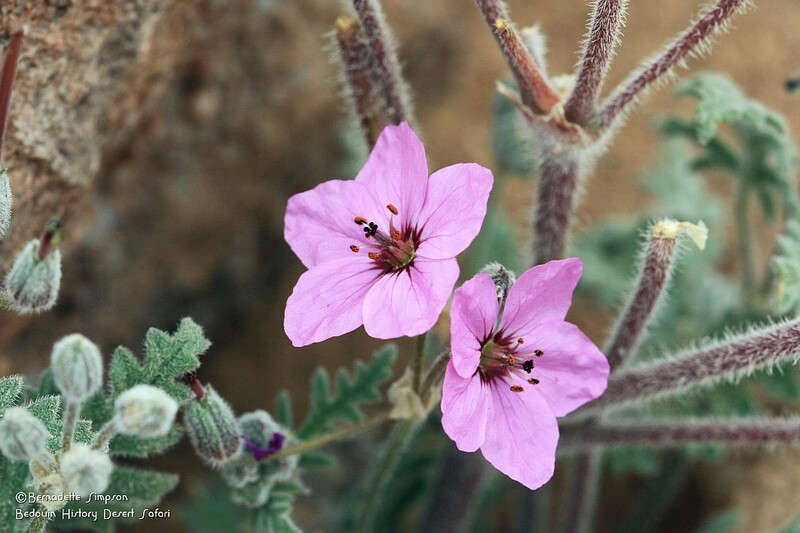 So we set off with Zeinab, Farah, Mohamed, and Omar to forage for tummayr (تِمِّير), the Bedouin name for Erodium crassifolium. Zeinab with her digging tool. 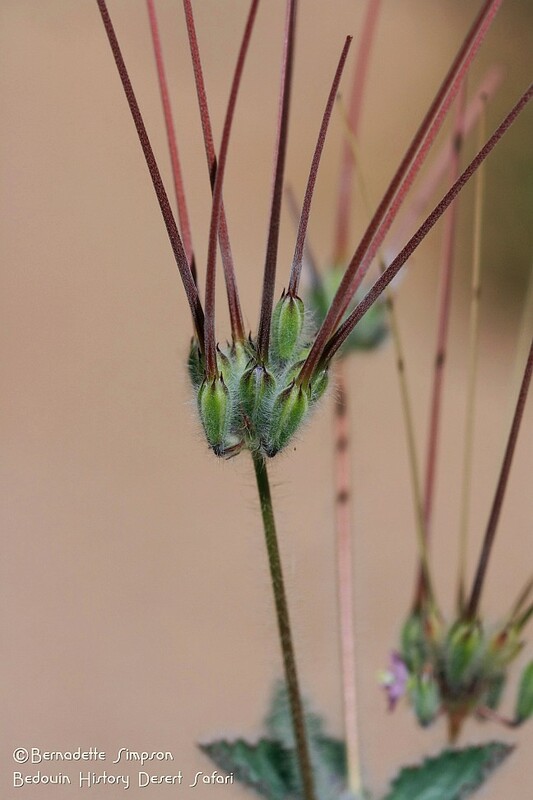 Known in English as Desert Storks-bill or Hoary-leaved Heron’s-bill, this plant has an edible tuber that grows deep in the ground. 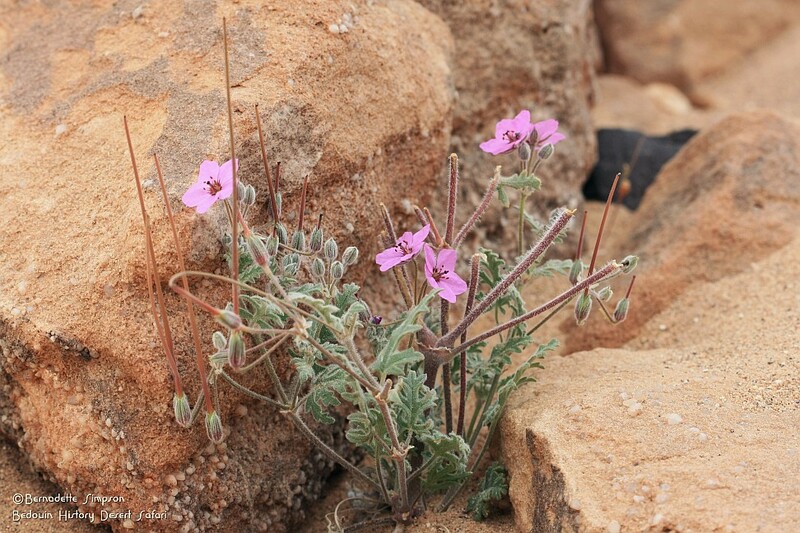 But there are eight different Erodium species growing in Sinai so finding the right one involves a knowledge of what tummayr leaves look like and where they grow. All Erodiums have fruit that look like long bird beaks, hence their common English name, but each species has distinct leaves. 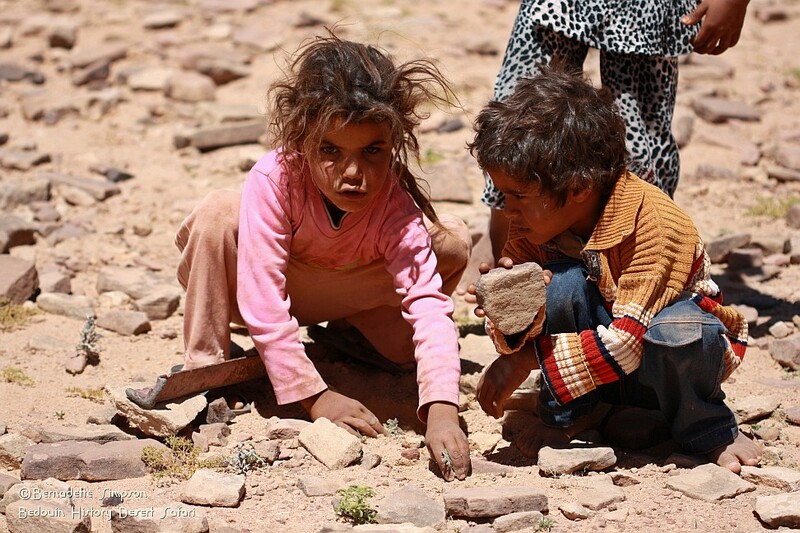 Zeinab and the other children are a wealth of information about the local plants, especially the edible ones, as foraging for these are a favorite past time of the Bedouin children who live in the desert for a few months of the year. 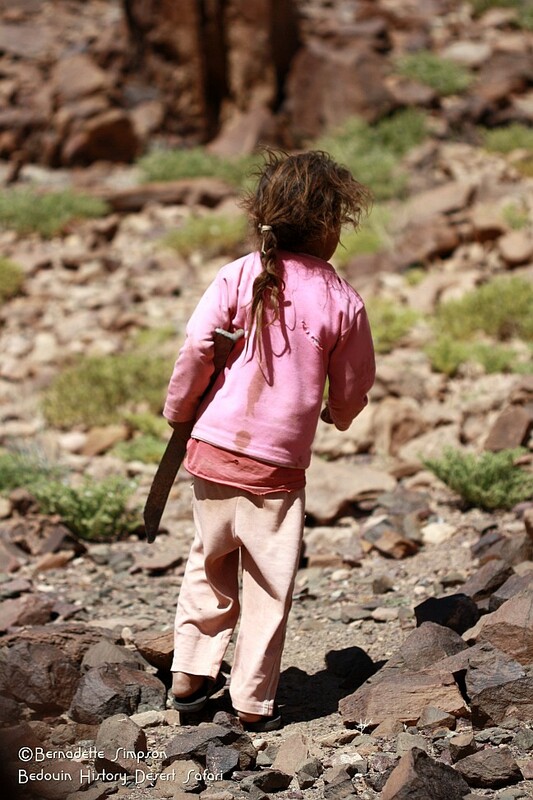 I followed Zeinab through the wadi, trying to keep up with her quick steps and even quicker digging abilities. I try to figure out which Storks-bills are the ones we are looking for and was cheered on by Zeinab when I correctly point out a large tummayr plant. Zeinab dug quickly, scanning the area to check on the progress of the boys, who are leading their own expedition with my husband. It seems that this had turned into a contest to see which “team” could find the most. But we are all successful and end up with handfuls of edible tubers! The children remove the skins with their fingernails and hand them to us to eat. The small potato-like tubers are sweet and crunchy. 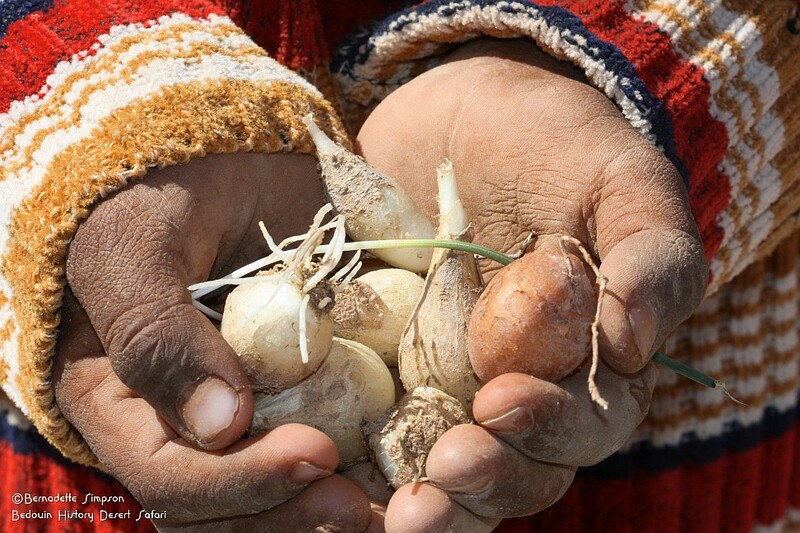 Along the way, the children have also spotted sweet desert onions. They are so quick to dig these up that I never see what the plant looks like when it is still rooted in the earth. The onions, possibly an Allium species, are sweeter and juicier than the tummayr. And easier to reach as they are not buried so deep in the rocky ground. Handful of collected onions and tubers. We returned to camp to share our foraged goodies with the other adults at camp, but they showed little interest in eating our treats. It seems foraging with friends is a childhood habit, something to entertain them during the long days in the desert. How lucky I am to have such amazing young friends!